There is a totally fun post over at Cinematical about a map of California— Paramount Pictures style. 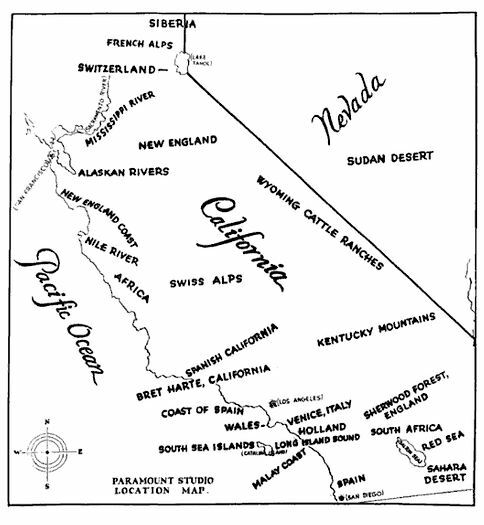 A solid 80 years before the words “runaway production” would shake the Hollywood infrastructure, this 1927 sketch of the Golden State illustrates the way the studios used California’s natural resources to represent the four corners of the world for location shots. Need the New England Coast for a moody melodrama? Monterey Bay. How about the soaring Swiss Alps? Welcome to the San Joaquin Valley. The Sudan Desert? Say hello to the Nevada border. And, my favorite: the greater Los Angeles area is ever so suited for doubling as everything from Spain to Wales to Holland to the Malaysian Coast.